One of my old favourites that I somehow never got around to posting. Hope you like it! I remember the first time that I had come across this photoblog and had gone through the archives, I had seen a Taj Mahal photo. 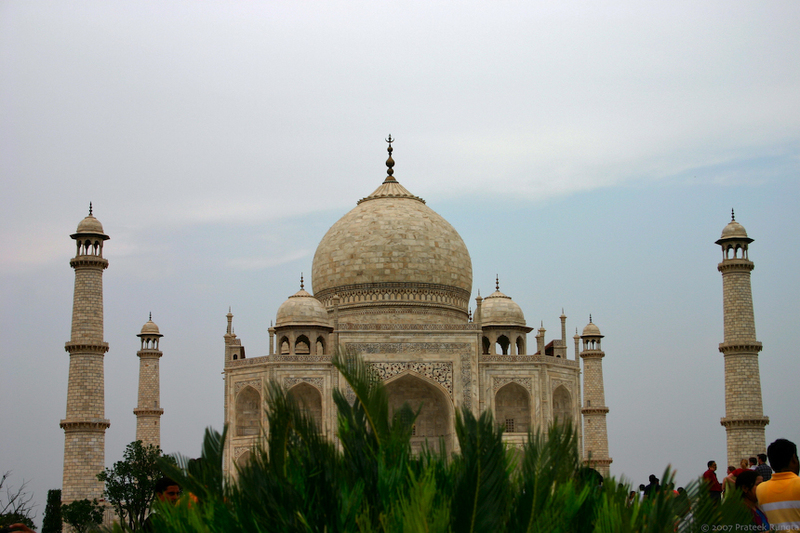 Though my experience of Taj Mahal was pretty unmemorable. That particular day it was so crowded, that I just hated that trip. P.S. Heh. I tried to answer YES to your question "Are you a Robot? ", and get back "Spammers, robots and aliens not welcome." Ha! BTW I just love "An _____ a day keeps the doctor(and Microsoft) away." one. It feels great to see my humanity check getting so much love lately because I did put a lot of thought into making it a pleasant experience. It was hard coming up with questions though, because I had to be sure that people could answer them without having to think twice. Sumedh, now that you speak of it even I did something similar earlier today. I was interested to see what message did Rungta have for Spammers, Bots and Aliens. I thought till yesterday that I had seen all those scripts but today I read something like enter this message without quotes. I think a system like this would be easy to circumvent if one really wanted to. I simply kept answering no ( The first question was ' Are you a human?, The second was about apple and the last one was 'Are you a robot'. Fortunately the reason this works is because spammers probably don't find it lucrative enough to write something specific for this site. This system, till it works is way better and faster than things like Captchas. You're right Aditya, this system would be very easy to circumvent if someone really wanted to but then I could fall back to serving the questions on images (like Abhishek had suggested earlier) rather than easily parseable text which would make it a lot harder for spammers to find a way past. I could fall back to serving the questions on images (like Abhishek had suggested earlier) rather than easily parseable text which would make it a lot harder for spammers to find a way past. But as long as the number of questions are limited, all it would take for a Spammer is to repeatedly try the same answer like 'no'. Easily prevented by generating Captchas like VariabIe1 operator Variable2=? Am curious, do you already employ that in your Humanity check? Heh, anyways any of the above mentioned is not required at all. Have kinda dislike them thanks to those crappy captchas from MSN and google. They slow you down. Nothing like writing an Apple a day keeps the doctor away though. Talking about Captchas you guys should find this interesting. reminds me of your India Gate pic… it resembles the grandeur. But as long as the number of questions are limited, all it would take for a Spammer is to repeatedly try the same answer like 'no'. Yes, but I would add constrains on the check if spam was actually making through. Easily prevented by generating Captchas like VariabIe1 operator Variable2=? Yup, and its surprising you haven't yet got one of those questions yet. Oh and thanks bengali and wannabe bengali. Probably have, but I think it's nice that you have probably bounded the numbers. I sure would remember if the system gave me 8703 * 98238 = ? Constraints, like what? This is getting interesting. Constraints like putting the comment for moderation before it can appear if a person gets the answer wrong twice and not allowing any more comments from that IP for the next 24 hours.